Gaming academic (and Kotaku guest editor) Ian Bogost shares with the world this scan from a 1982 issue of Videogaming Illustrated, in which 1982 celebrities share their thoughts on the video games. 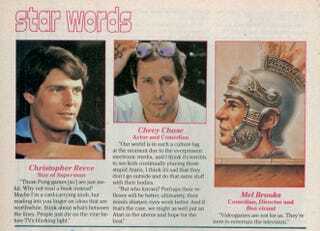 Being 1982, we've got a stellar lineup, including comedian Mel Brooks, Superman's Christopher Reeve, and another comedian, Chevy Chase. And remember, this is 1982, so all are at the height of their powers. Reeve and Chase are quite mean. Though, being 1982, that's understandable. Brooks, on the other hand, issues a line that should be inscribed on the gates to video game land.